What we love right now. As far as we are concerned, change of season is always a beautiful thing. There is no better inspiration for expression, than mother nature. This stands true for our art as well as our personal aesthetic here at L' atelier Noir. The transition from spring to summer is a subtle one. The weather change is so gradual that it can be difficult to transition your wardrobe. Our favorite pieces for summer fresh in NYC. The light weight tee. Cotton/Linen always serves you well. Concentrate on your body type. The biggest issue you can have is not catering to your shape. If you can wear something that is 'fitted', then do so. Nothing looks sloppier than a lot of extra material (mistakingly) bunching up or slouching off of you. If you are a larger gentleman, look for something that compliments your 'size'. Shorts. Above the knee shorts were my choice and will be for the entire summer. Pastels and seersuckers are the way to go. It just screams summer. Again, focus on the fit. (Camo & Cargo are also a thumbs up right now). The Blazer. 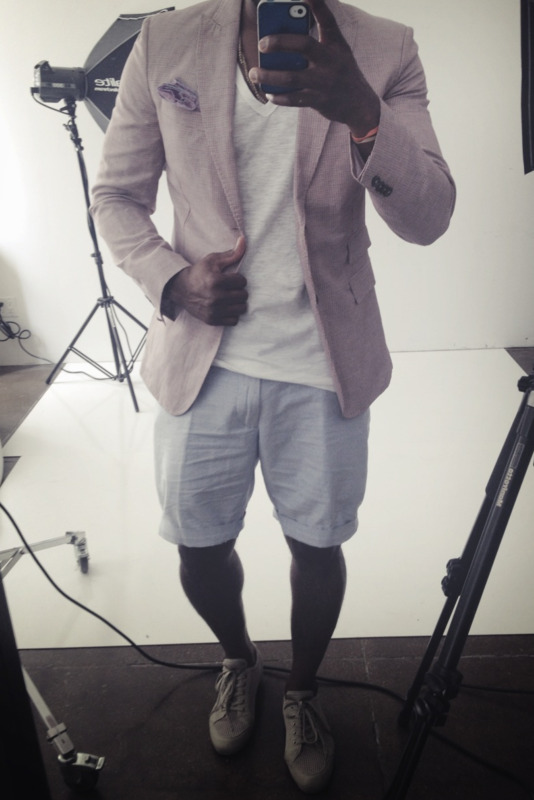 For summer you can't go wrong with a light weight blazer. There are a few choices in material but whatever lightweight material you decide to go with, pay attention to the silhouette. Lines and shapes are so important to the aesthetic. Footwear. this may be the most important part of the look. This is the accent that moves things from casual to dress in an instant. I chose the Dolce & Gabbana cotton and canvas Madagascar shoe. It is my favorite shoe for this look (and we are Dolce & Gabbana addicts over here). The lines and shape of a shoe are just as important if not more than any other aspect of the look. A nice sneaker also works with this look. Most of all, wear what's comfortable. Wear what you love. Your confidence in your appearance will carry the look. Stay fresh. Poeple will notice.